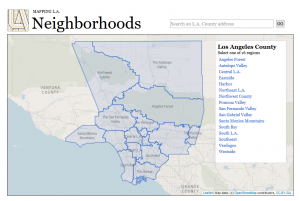 For this month’s edition of Mapping For Good, we’ll be taking a look at one of my all-time favorite resources for in-depth web maps and spatial information, “Mapping L.A.” from the Los Angeles Times. I’ll come clean from the start on my biases as a Southern Californian now living in Colorado and would guess that the data to be found on the site holds less appeal for those with no connection to LA. Nevertheless, as America’s second-largest city and by far the largest county in the nation (Los Angeles has roughly 9.4 million residents! ), the information contained in Mapping L.A.’s many maps often hint at greater trends in the US as a whole. From that initial project and the many threads of conversation to follow, Mapping L.A. was born. Now expanded to the entirety of Los Angeles County and including 158 cities and unincorporated places and 114 neighborhoods within the city proper, it stands as one of, if not the most, thorough mapping portals for a major American city. There are so many questions one can answer with it that providing a generalized summary in a one page article is nearly impossible. Curious what percentage of the LA neighborhood of San Pedro was originally born in Israel? (11.3% in case you were). Want to know the exact number of veterans in Echo Park, when they served, and how it compares to the county and the nation as a whole? You can do that too. All figures are accompanied with detailed graphs and charts as well, a true data-lover’s paradise. The project continues to grow, spurred on largely by the heavy community involvement mentioned earlier. If you live in SoCal or are just a data-freak like myself, I highly recommend you poke around the site for a bit, you will not be disappointed! This entry was posted in The Geospatial Times and tagged California, Los Angeles, Mapping For Good, The Geospatial Times, Tips & Tech by Apollo Mapping. Bookmark the permalink.